Much has been made of Google’s recent decision to cease running a censored version of its search engine in mainland China. Although the search giant did censor its results (via Google.cn) beginning in 2006, it decided in January 2010 to discontinue that policy. The decision triggered a passionate debate about the broader consequences of Google’s actions. Many wonder if other established businesses will follow Google’s lead by challenging China’s government. If so, the Chinese regime could be compelled to reduce the incidence and severity of Internet censorship it imposes – the “Great Firewall”. Perhaps more than any other nation, China strenuously restricts what its citizens see, hear and read. Many native Chinese don’t know of 1989’s Tienanmen Square massacre because the government bans independent journalism. Instead, as the Weekly Standard explains, young Chinese who search for “Tienanmen Square” see only historical information about the location with no reference to the 3,000 people who were killed there. One way China controls the flow of such information is through its “Great Firewall,” a comprehensive filtering system that allows only government-approved websites to reach its citizens. Wikipedia reveals that the Great Firewall consists of more than sixty separate regulations on Internet use, state-owned ISPs, and an “Internet police force” in excess of 30,000 people charged with erasing blog posts or comments which criticize the government. The Chinese government’s insistence on restricting Internet use makes it difficult for web-based companies to operate there. Google believed it had reached a compromise in 2006, launching a censored version of its search engine at Google.cn — blaming China’s government for the censorship. This, Google believed, was a step toward gradually reducing censorship in that country. That outcome never materialized. Not only did China fail to scale back its restrictions, but as CNN reports, Chinese hackers successfully penetrated Gmail in a “politically motivated attempt at intelligence gathering” against human rights activists. Amidst this and criticism that the company was enabling repression, Google announced in January that its censored Google.cn search engine would be discontinued. By mid-March, visitors Google.cn were redirected to a normal Google website operated by uncensored servers in Hong Kong. Wired maintains a lengthy list of FAQs regarding the confusing aftermath of the move. In one sense,you could argue that Google won this battle because visitors to Google.cn now see unfiltered search results for any query they submit. But as Wired is quick to point out, that is no guarantee of mainland Chinese being able to read full, factual reports of controversial topics. China’s “Great Firewall” still blocks clicking through to such websites even if they appear in search results. Google itself now maintains a continuously updated log of which services are available in mainland China. Google’s choice could soon prove costly. Wired explains that Google is virtually certain to lose some deals for powering Chinese search portals and mobile devices as a result of the Google.cn pullout. Yahoo! and Microsoft’s Bing are no doubt aware of similar risks. Furthermore, China still figures to someday house more web users than any other country. Taking a stand against Chinese censorship today could mean losing substantial revenue and profits for decades. While Google only derives about $250 million -$600 million of its annual $24 billion in revenue from China (according to the Associated Press), the company figures to leave more on the table when the number of web-using Chinese exceeds the 350 million people online today. 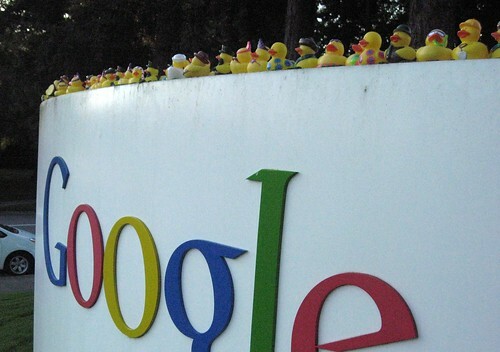 On March 22, Google’s stock price fell 0.4% on the news, while Chinese rival Baidu rose 2%. Google’s ad sales unit, business e-mail services, and Android services will continue to operate in China. Non-search companies have already announced intentions to pull out of China. The Star Tribune reported on March 24 that domain name registrar GoDaddy was leaving due to the government “demanding pictures and other identification documents from their customers.” MSNBC notes that GoDaddy only had about 27,000 .cn URLs under management, and that the company declined to state how much revenue that amounted to. But the number of Chinese URL registrations will likely rise in the future, which could make GoDaddy’s decision a costly one. Another top registrar, Network Solutions, ceased processing Chinese URL registrations in December 2009. 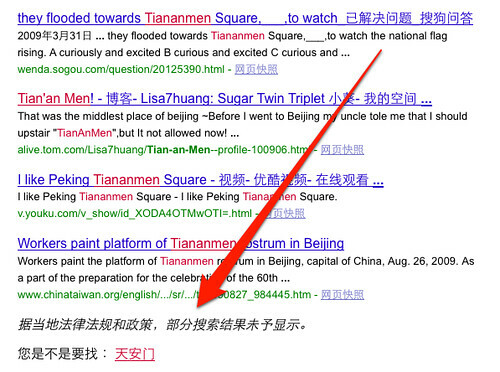 It is also true that the search services still censoring in China (Baidu, Yahoo! and MSN, to name a few), are censoring far more than Google was, according to a separate Wired article called Only Google Could Leave China. Whether more companies retreat or the Chinese government reduces its censorship, Google’s pullout begins an important new chapter of the discussion.